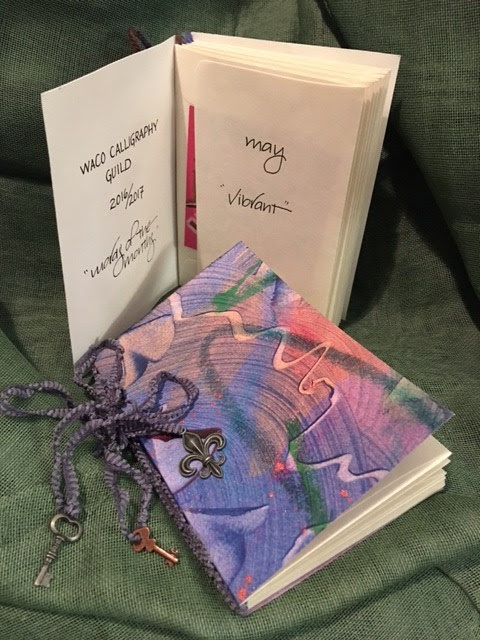 Linda Hardwick will be teaching how to make a booklet to hold the 10 words of the month that we have been making for this guild year. The 3”X 3” cards will be placed in the envelopes and linked together forming a hinge. A cover will surround the envelopes, which will be bound with yarn or string. The word for April, exotic, will complete the 10th envelope of the book. If members did not participate in the word designs, the book can be created to hold other items, such as notes for a friend. * Decorative paper (at least 8” X 6”): Paper should be cover-stock weight, at least 120 lb. Bring watercolor papers that you have inked, or painted; paste papered; marbled, etc. If paper is painted on both sides, the inside will look colorful, too. Or, if you leave it white on the reverse side, you will be able to write on the inside cover. Once you learn to make this simple book, you can decorate them many different ways and sizes. The sky is the limit!